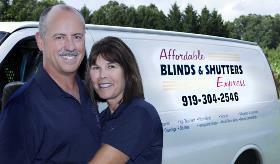 Open since 1998, Affordable Blinds and Shutters Express serves customer’s window needs across North Carolina’s Triad. A family owned business, Affordable Blinds and Shutters Express seeks to provide you with the highest quality product. Curtis and Deborah Davis started their business in Mebane, NC and soon built a reputation as a favorite of many residences and businesses. Word-of-mouth advertising launched them into living rooms, kitchens, lobbies and offices all over the Triad. Both Curtis and Deborah enjoy helping customers find the perfect window treatment. They also work with several local interior designers and provide service and support for all the products they sell. Their sons help out with estimates and installing. Products range from faux blinds, silhouettes, shades, verticals, micro and mini blinds, tropical wovens, vertical blinds, cellular shades, poli-blinds, remote control blinds, Roman shades to all sorts of shutters. To begin, you can count on a free estimate. Bell Ford, Verizon, Peppertree Village, Mill Creek and Governor’s Green are just a few of the satisfied customers who have counted on Blinds and Shutters Express. Come by the showroom and find out for yourself why one good referral leads to another. Conveniently located on 7811 US Hwy 70 in Mebane, hours of operation are Monday through Thursday 9 – 5, Friday 9 – 2, and other times by appointment. You can also contact us via email or call (919) 304-2546. Special thanks to Stacy Poythress of Poythress Studios in Mebane for our family pictures!